A core programme of CALM Africa, which CFU funding helps to support, is education. A key pillar of child protection is quality education, keeping children safe in schools and giving them the skills to enrich their future. The Uganda National Examinations Board has released the 2016 Primary Leaving Examinations results. The results were received with excitement at JMLC, as the students performed very well. “The performance was very good. Am very happy about it,” announced CALM Africa Team Leader, James Ssekiwanuka in his office at JMLC. English was the best performed subject. “We thank the Almighty God and appreciate the prayers of stakeholders and people of good-will for their continued support,” added Geoffrey. In 2016, JMLC had 23 candidates sitting for PLE, interestingly for the first time, girls were more than boys. The class had 12 girls and 11 boys. JMLC also had candidates from other schools register to do their examinations under the JMLC centre number. “We had no control over the performance of students from other schools who registered to use our centre number. Not all students who didn’t perform well are from our school. Since we want to help other schools, when they asked us, we accepted to register their students under our centre number,” James explains. “It is important to note that our goal is not to teach students to just pass exams. We are about character formation, education for responsibility and preparing students for a better future. We are about moulding good citizens for Uganda who would contribute to their country’s development. When you emphasis character, conducive environment for learning and less teaching and more learning, then passing becomes an inevitable outcome. Passing exams is good as it manifests the school good works and raises the school profile, ‘’ the Team Leader added. The principle of JMLC is to provide quality education to the children. “And education to us doesn’t necessarily mean performing well in exams, when in other areas your performance is poor,” emphasizes James. JMLC also participates in co-curricular activities like sports, debates, leadership training and domestic tourism where students and staff visit different parts of the country. The school is also a strong competitor in inter district and national sports championships. “We get reports that students of JMLC are always hardworking, humble, disciplined, focused and God-fearing, based on performance reports on our students who are now in secondary school,” happily narrates James. As a sign of appreciation and motivation, the director and administration of JMLC organized the ‘Director’s Handshake’ event for the students who passed. Some of the gifts handed to the students were sent in by the foreign friends and supporters of JMLC. 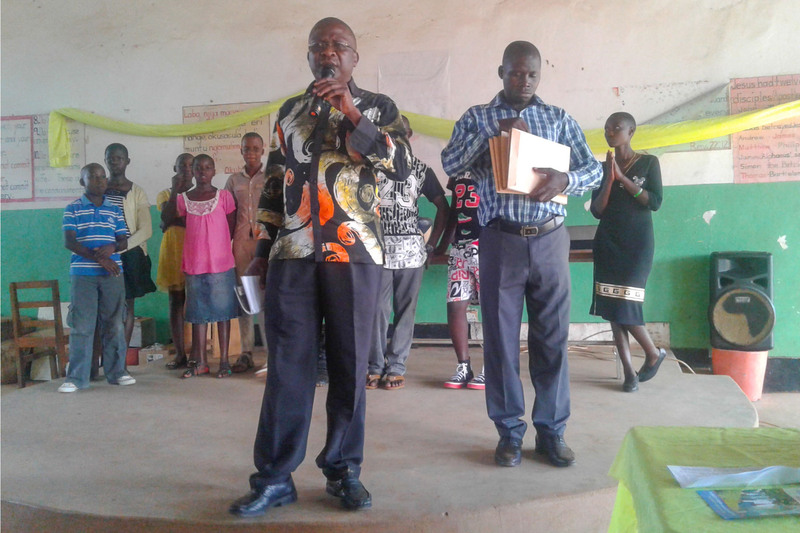 “I call upon parents who have school going children, and have not registered them with us, we still have vacancies from nursery up to primary 7,” appeals Geoffrey. Geoffrey further states that, the fees structure for JMLC is also favourable. The school is also fighting hard to acquire a van to pick students who might be coming far from the school. The next academic year starts on 6 February, when the first term opens. The administration and teaching staff of JMLC is already preparing for the academic year, and promise to continue improving the exams performance and character formation of its students. This is a great achievement for us to hear. It means the pupils we’ve been working with over the last few years are set to continue in secondary school. It means that the standard of teaching and experience of the primary children is being maintained, and improving. It means that our donations are helping to ensure this is possible for these children. Our thanks to everyone who supports JMLC or has in the past, through donations to the school itself, sponsorship of a child, or volunteering there working with the staff and children. Last week was our AGM, Suzanne, our Chair gives a personal update of the meeting….. I flew out of Dundee last Friday in FlyBe’s purple Dornier propeller airplane, looking forward to attending Children First Uganda’s AGM the next day. I can’t quite believe that this will be our 8th AGM. 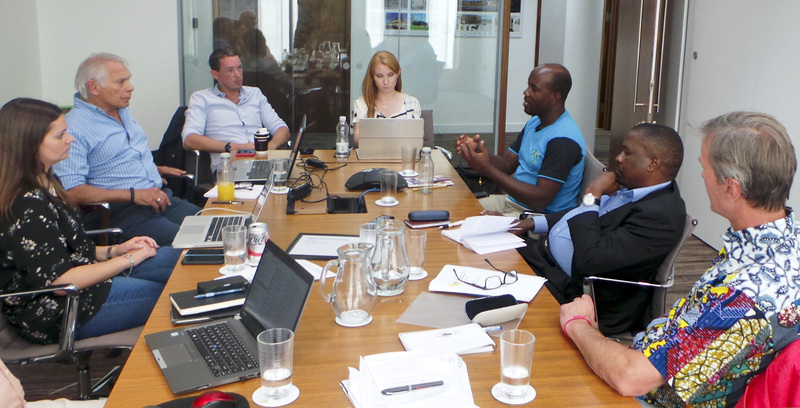 However, I did know that this one would be rather special, as James Ssekiwanuka (Director CALM Africa) and Joseph Luganda (Programme Coordinator) were in the UK and would be attending the meeting. The engineering consultants Elementa had kindly offered us a meeting room in their smart new offices in London at no cost. Everyone could make the meeting; it was great to see Tony (Bateman), Andrew (Drakeford), Natalie (Moore), Terry (Goddard), Dee and Paul (Winks). Then straight down to business. Children First Uganda’s principle aim is fundraising to support Calm Africa’s work (our sister charity) in Uganda. So it was great to hear Andrew reporting that we have sent over £34,000 to Calm Africa last year, whilst our total expenditure was only £150 (which were mostly admin and bank charges). Our other goal is to increase the profile and awareness of Children First Uganda and Calm Africa. Much of this work is championed by Natalie who is our ‘Media Lead & Fundraising Co-ordinator’. Natalie has done a great work managing our website and social media. The website blog offers great insights and heart-warming stories about the wide range of projects that we are involved in. As I had anticipated, James and Joseph stole the show. It was a privilege to hear James describe how his team support some of the most vulnerable children in Kampala. He told us how the staff provide a safe and supportive school environment for the children in their care. James described his ambitious plan to pump clean water from their local well directly into the Jolly Mercy school. He closed by sharing his vision of building a healthcare centre for the local community. After lunch Joseph spoke about the grassroots community work that their team provides, and he explained more about the ground breaking foster care programme that he runs, which allows children to be cared for in their own community. It was good to meet Joseph, I had heard so much about Joseph but I had never met him. What are my closing impressions of the day? I was encouraged that as a result of the regular giving of many Children First Uganda supporters, we are now able to send monthly donations to support the Calm Africa team. I am proud that nearly all the money we raise goes directly to support children that are in Calm Africa’s care. It is good to know that projects like the school sponsorship scheme are giving children hope. Every year I am struck by how far even a modest donation can go in Uganda. As I climbed back on the Dornier plane at Stansted, my hope is that when the CFU team met in 2017, we may have helped turned some of James’s dreams into reality. ‘A child who has never travelled, will always think his mother is the best cook’, is a common saying among the locals. Despite Uganda being endowed with lots of unique animals, plants, birds, Great Rift Valley and other geographical features, few citizens have taken a travel-tour around the country. Jolly Mercy Learning Center, a primary school under CALM Africa, has embarked on a program of promoting local tourism, by taking its pupils to places that are a tourism attraction. “Teaming up with Link International, we took our pupils and staff to Kasese, in western Uganda, for a four-day tour,” explains James Ssekiwanuka, the team leader of CALM Africa. The trip was two-fold. The pupils had gone on a tour of one of the most scenic part of the country. But also, JMLC is partnering with a school in Kasese, Kyambura Primary School. This trip gave JMLC pupils a chance to meet and interact with fellow pupils from Kyambura. As part of the partnership bonding, the pupils from the two schools engaged in a debate, competed in a football match, while the teachers congregated the primary seven pupils into a single classroom for classroom lessons in English, Maths and Science. “This was intended to introduce the students of the two schools to get to know each other, and also compare notes on the subjects they are studying,” adds James. 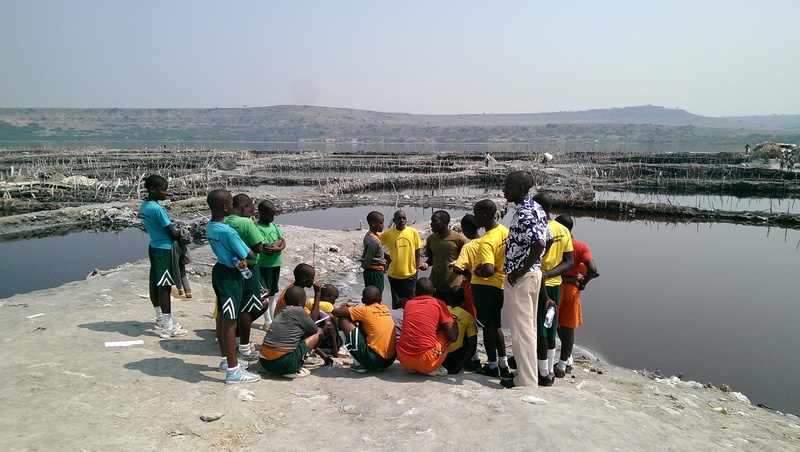 After the classroom sessions, pupils from both schools went on a tour around Kasese.“Some of the places we visited include Kyambura Gorge, Kazinga Channel, Bunyaruguru crater lakes and Lake Katwe salt mines”, narrated Joseph Luganda, CALM Africa’s Programs Manager. “While in the Queen Elizabeth National Park, we saw lots of wild animals, with most of the pupils seeing these animals for the first time. 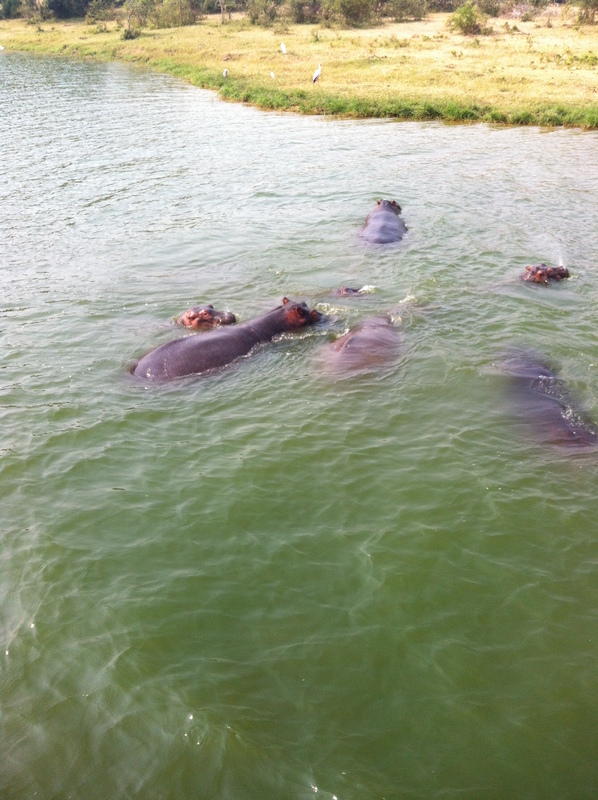 We saw 5 lions, 7 elephants, lots of buffaloes, hippos, Uganda cobs and lots more,” Joseph adds. “For most of our pupils who come from Nangabo in Wakiso here in central Uganda, it was there first to travel out of the region, and to travel such a long distance. Kasese is about 400 kilometers from here,” James described. CALM Africa would like to make this a routine tour, and even host pupils and staff from Kyambura Primary School at JMLC. “We would even like to take some of the parents, accompanied by the pupils, along these tour trips so that the parents also get to appreciate local tourism and encourage their children to explore more,” the team leader revealed. Uganda is regarded as a number one tourist destination in the region, but most Ugandans haven’t toured their own country. This is the attitude that CALM Africa hopes to change, starting with pupils of JMLC. CALM Africa strongly believes that children have a right to know and inherit a good sustainable environment. The rapidly increasing population is exerting more pressure on the environment resulting in the increased need for space, food and shelter, indiscriminate deforestation and poor waste management. They arise due to limited public awareness of the importance of nature and environmental conservation, inefficient socio-economic policies and practices that fail to cater for nature and environmental conservation in light of social and cultural decay and collapse. We can change this by actively involve young people to take part in local tourism and appreciate the plants and animals we have and be ready to promote conservation as well as appreciate ecological balance. 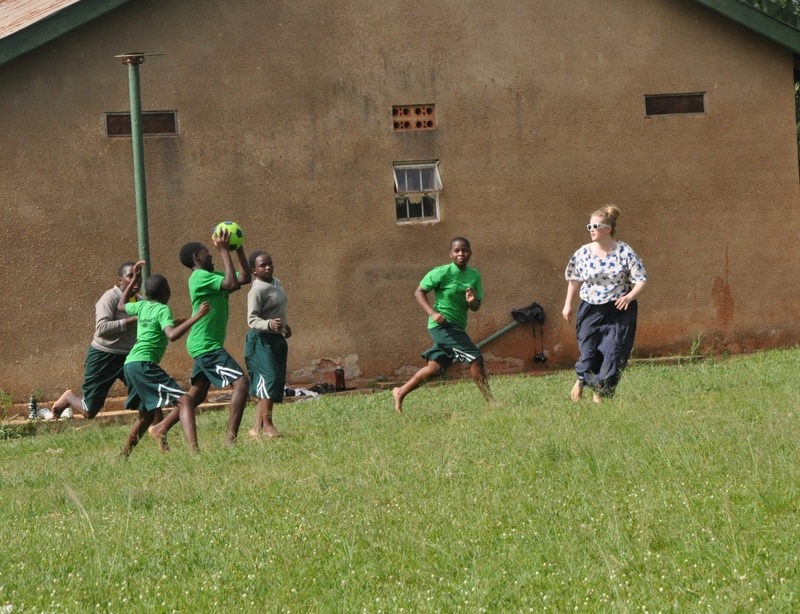 Alice Brown from England is a volunteer visitor at CALM Africa in Uganda. In between class teaching on a break, she shares a few insights about herself and what brings her to visit. This is my first time in Uganda, though I have been in Kenya before. I wanted to visit somewhere else in Africa, and when I saw the CALM Africa project and what they are doing with families and children, I decided this was the place to visit. At the moment I am at University, doing a course which is closely related to the field work of CALM Africa. This is the type of organisation I would like to work with in the future; helping different communities to develop and attain basic necessities, Alice explained her mission. Alice further stated that, she liked it here: everyone is really friendly and welcoming. I have been here at the school, Jolly Mercy Learning Center, and am looking forward to going out to the villages and visit families. Unlike in Kenya, the English with the pupils here is much better and this has made the interactions easier and more straightforward. It is interesting to see how they do the assessments for children and families, visiting the homes to identify and verify the child’s different problems, needs and determine the kind of intervention to offer. The problems back in England are not as severe than those I have seen here in Nangabo, Wakiso, Uganda. A lot more work needs to be done here. A bit more money needs to be put in the provision of services that affect the communities. Like in education, it would be more efficient if there were more schools well equipped to educate the children at a cheaper cost. It is not fair that the poorest of the children should get the poorest forms of education. I have not had challenges per se but rather different experiences. Like when I visited the slum areas, it’s quite difficult to see the conditions people live in; it shows and proves why a lot of work needs to be done here. There needs to be more support in helping communities achieve their potential. If conditions do allow, I would definitely like to be back here. It has now become an annual activity that CALM Africa hosts students from Loughborough University on a field placement program. Earlier this year, in May, students again joined the team in Nangabo to volunteer as part of Loughborough Students Union Action during their Easter holiday. The visiting students work on one of the ongoing projects, however they are also interested in other projects like teaching and making family assessments for foster care support. 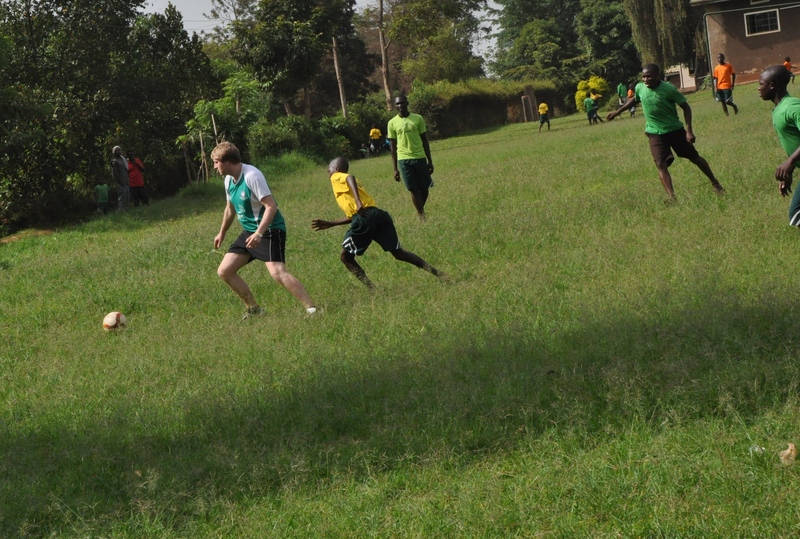 They also engage in sports and games, like playing football and netball with the pupils of JMLC. They offer their energies and participate in our programs; that vote of confidence is to say “yes I am ready to make sacrifices for the cause”. This support encourages CALM Africa’s cause of promoting rights of children and enhancing child protection mechanisms. Last year’s team helped to start the Teachers’ House project. “They helped in the digging and construction of the foundation phase. This particular four have come at a phase when we have finished the roofing. They have been actively taking part in plastering and painting of the walls”, explained CALM Africa’s team leader. As CALM Africa bid the visiting team farewell, Benedict Anguyo, the operations manager CALM Africa updated the team on the impact of their work. “The work you have done is not simple work. Those four teachers quarters’ rooms that you painted are ready to be occupied by the end of this week and the water stand is ready to have the tank put on. I therefore thank you for actively getting involved in the activities of CALM Africa”. Benedict added that it is not easy to understand the Ugandan situation, “but for you to come here and spend all this time with us, we are very grateful”. “And you thus go back as our ambassadors, to tell the story and the progress we have made,” added Benedict. Israel Ssekanjako, CALM Africa’s Senior Field Officer extended his appreciation to the team for the time they have spent, the support they have rendered to CALM Africa on its projects, the children of JMLC and community members through the community outreach programs. “You have witnessed what we do; child protection issues, fostering and other humanitarian child rights’ issues,” added the field officer who accompanied them on their field trips. Programme manager of CALM Africa, Joseph Luganda, recognised the act of sharing the group had exhibited. “You have been sharing with the children and the communities. When you share with them there are degrees of comparison between UK and Uganda, when they do that that promotes the existence of CALM Africa. He extended thanks to the University for continuously supporting the visiting program. The team leader of CALM Africa, James Kimera Ssekiwanuka was equally full of praise for the team. “We are very aware that deciding to come and work is a sacrifice, because you spend your time, forego your personnel convenience and collect money for travel. James urged the team that in this globalization era, “Your coming makes you part and parcel of CALM Africa’s history. And you are now leaving a legacy which will continue to cement the relationship we have with your university. Let us keep in touch and grow our network”. As a token of appreciation, the team leader gave a cup, wooden cup and personalized card, as a sign of cherished friendship. Sally: “We didn’t really know what to expect when we set off for this trip. It has turned out to be more than we expected. We felt so welcome and party of the team right away, that made us comfortable, at ease and we have enjoyed every part of it. We hopefully look forward to coming back at some latter time. In an effort to expand the community outreach and child protection awareness programs, CALM Africa has started using radio programs. Together with Naguru Teenage group, CALM Africa staff has been participating in radio shows to talk about child protection mechanisms on Radio Simba, a vernacular broadcasting radio station in Kampala. “We started the radio program last year, but this year we have taken it to another level by participating in the program more frequently,” explains James. NetworkAfrica ranks Radio Simba among the top 20 radio stations in Africa. Naguru Teenage group engages in counseling and guidance of the youth. Calm Africa concentrates on ensuring that communities embrace child protection mechanisms in urban and rural areas, basing on national laws and international conventions. National laws include the Uganda constitution, The Children Act and The Penal Code Act Cap 120.Policy frameworks include The Adoption of Children Rules, 1997. International convections include The UN Convention on the Rights of the Child. There are Regional instruments protecting the rights of children. 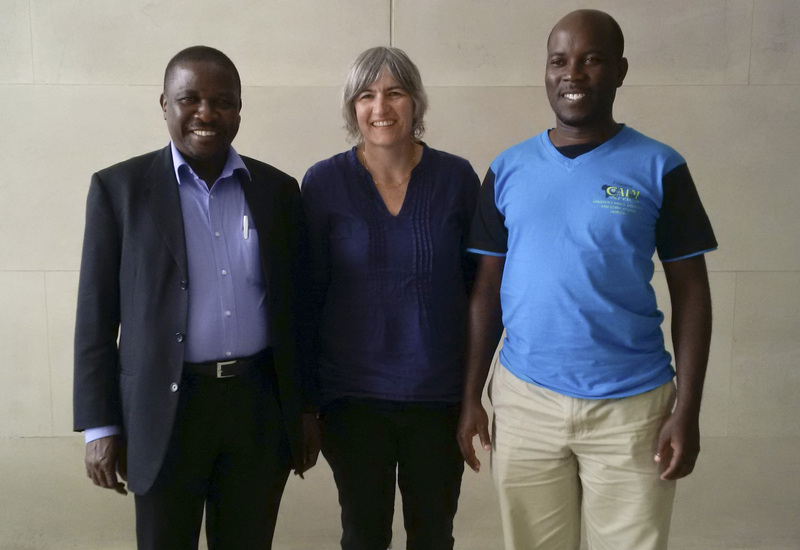 “The aforementioned give us a very good direction and guidance in advocating for child protection and promotion of their rights,” explains Dr James Ssekiwanuka, Team Leader of CALM Africa. “We have the legal framework and the policy framework,” he adds. The government of Uganda through the Ministry of Gender, Labor and Social Development has a policy framework on how vulnerable children and orphans can be assisted and which services to give them. A number of government agencies are involved in this framework. These include the police, local government, judiciary and civil society organizations. “The most important person in the protection of a child is the parent,” adds the Team Leader. “CALM Africa always requests family and community members to take responsibility to provide support for children who don’t have parents”. According to James, when it comes to Uganda, there is a problem of AIDS pandemic. “AIDS is still a contributing factor to the child welfare problem. It has led to the emergence of child headed households,” he explains. Other factors include conflict, famine and urbanization which have also created unfortunate circumstances for children and family systems. Whenever CALM Africa staff goes for the radio talk shows, the public is given an opportunity to ask questions about child protection. When we talk of child protection, we are advocating to ensure that every child enjoy their rights. Children who are disadvantaged are the ones who cannot easily enjoy their rights; they need special focus and tailored programs. There is no doubt that the problem of child neglect, abandonment and child trafficking continue to gain more attention as a result of globalization. Globalised communications systems have allowed new technologies to shade light on this subject. From these talk shows, CALM Africa has generated new ideas. One of such ideas is challenging the government to come up with agriculture investment banks to support rural farmers. According to government statistics, over 80% of Uganda’s population is dependent on agriculture, making it the backbone of the country’s economy.“If we have these agriculture investment banks, it will help to boost the sector and the families engaged in agriculture. The food security guaranteed and the income raised from the sales will help in providing for the famer and their children. Other banks don’t appreciate the needs of our farmers, and the unpredictable dynamics that affect farmers like prolonged drought, agriculture produce price fluctuations. Children should be given an opportunity to discuss matters which affect their welfare. This results into a children’s parliament at every level, including at village level. At Jolly Mercy Learning Center, CALM Africa encourages staff to hold a children’s parliament. According to Team Leader, this is different from the debating club; this is where children are given chance to air out their views on how they are being taught, displayed, the food and other issues that affect their life. Giving the children a voice is a very positive step in helping them reach their full potential. In Uganda like anywhere else, children are still a weak link in the human chain and are in most cases unable to properly defend their rights. This necessitates concerted action on the part of major entities of society like government departments, civil society organizations, alliance groups and community organizations, to strengthen child protection mechanisms. Children are our future. They must be protected, nurtured and inspired at any cost. Here at CFU, we raise funding to help all aspects of CALM Africa’s work. Part of our donations go towards CALM Africa operational costs and this can include the transport to make sure they can reach these outlets. Good hygiene, keeping our children safe, through improved sanitation at JMLC. 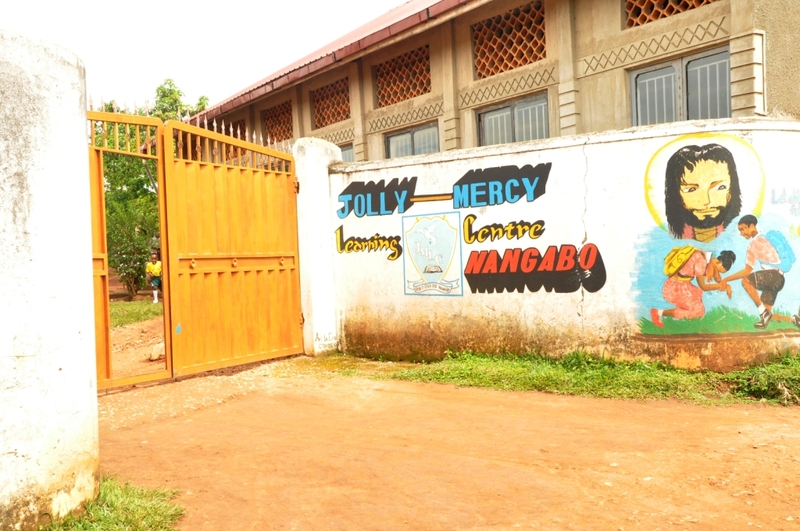 A young boy wearing a green T-shirt with a Jolly Mercy Learning Centre label on his front emerges from a corridor. He goes on to a water dispenser to wash his hands with soap before running back to class. The corridor he emerged from leads to and from the school’s restrooms. These are divided into two sections; one for boys and the other for girls. Each section has toilets, urinals and bathrooms. 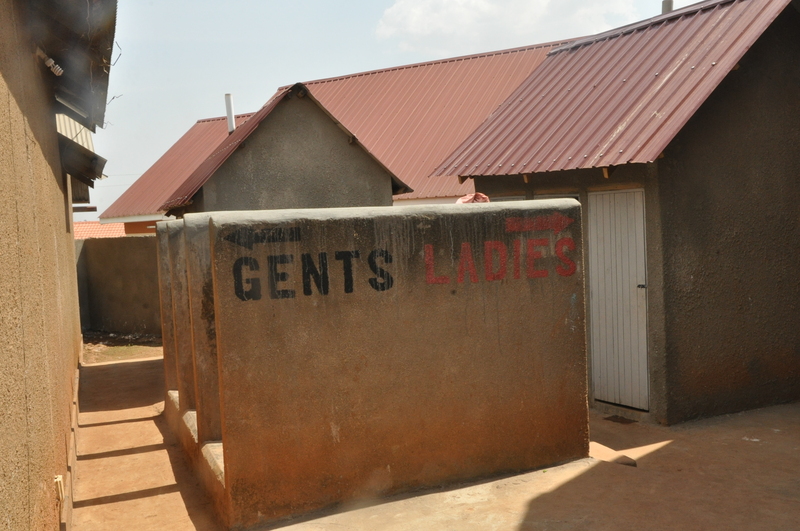 These latrines have been serving pupils of JMLC ever since it was officially opened in 2009. Serving a growing population that now is over 200 members. “We had never done any renovation on these structures. Most of the wooden doors were broken or not locking and weather beaten. The paint had peeled off due to some leakages from the roof. And the drains were partially blocked,” explains Dr. James Kimera Ssekiwanuka, the Team Leader at CALM Africa. CALM Africa is the parent company of JMLC. This poor state of sanitation was bound to cause some illness to the young community at JMLC. Yet health and wellbeing of children is a core concern of CALM Africa and hygiene is critical to this. “Thanks to the very generous assistance from a couple of long-term supporters; we have been able to give our toilet blocks a new facelift,” says James with a happy face. “We have fitted in new doors, a new roof, cleaned and opened up the drainage channels, painted all the walls and cemented the floor surrounding the toilet and bathroom blocks,” he further explains. One of this couple providing such valued help visited CALM Africa and volunteered at JMLC about seven years ago and has remained in contact ever since. She also sponsors one of the children at JMLC. “The children are now very happy, especially the girls. This is because the new surface floor is easy to clean and the draining water runs off fast, keeping the place dry,” adds the team leader. The 60 feet pit was examined by the contractor and found to be in very good condition to serve over 10 more years. To maintain high hygiene standards, the toilets are fumigated every term during the holiday periods. JMLC uses the pit latrines due to lack of piped running water. “We are not connected to the National Water and Sewerage System because the network doesn’t extend to our location,” explains James. 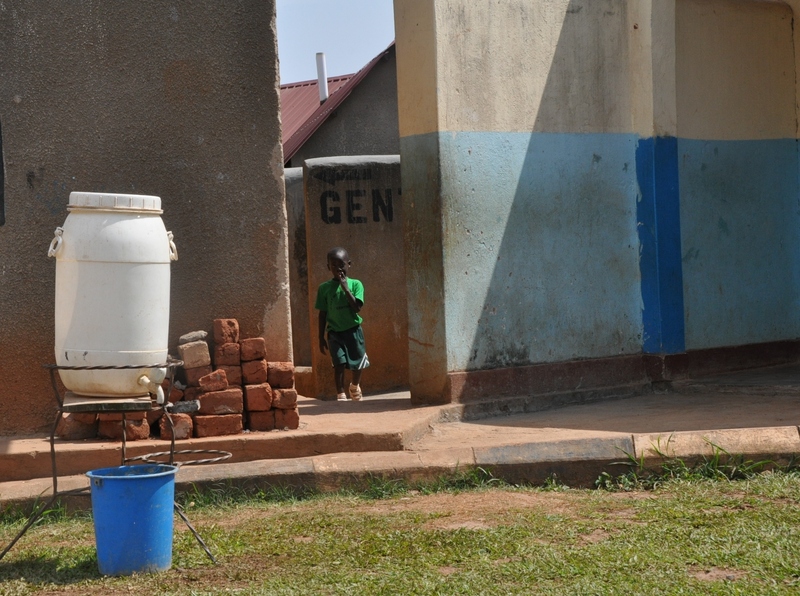 “We do have a borehole, and our future expansion plan is to pipe water from the borehole to the school and then be able to use flushable toilets”. But for now, sincere gratitude goes to those who have helped CALM Africa provide a level of sanitation and hygiene to keep the children safe. We are in that season when we celebrate results from last year’s national Primary Leaving Examinations, as they are released by Uganda National Examinations Board. And at Jolly Mercy Learning Centre, the celebrations are still on and being used to motivate this year’s candidates. “We had had 12 pupils of JMLC sit for Primary Leaving Examinations last year. Of these, 5 passed in first grade, while the remaining 7 passed in second grade,” discloses teacher Martin. Martin is the P.7 class teacher. Martin adds that the best performed subject was English followed by Social Studies. This has inspired the staff and pupils to work hard and get more first grades with this year’s candidate class. This year, JMLC has 19 children in P.7. Out of these, 11 are girls and 8 boys. Martin predicts at least 10 first grades. Most of these candidates are in the boarding section of JMLC, with a few day scholars. “We have always worked hard to improving PLE performance over the last years, and surely Martin’s prediction is within our progressive target range,” concurs, Dr. James. JMLC boosts as a fully registered primary school with the Ministry of Education and Sports, and with its own Uganda National Examination Board centre number. “Some schools without centre numbers always request us to have their candidates sit for the examinations at our school,” James adds. “For instance, whereas last year 30 candidates sat their exams here, those for JMLC were 12,” he concludes. JMLC pledges to nurture children as they ‘Grow in Grace and Knowledge’. Giving parental care to children is a step in nurturing tomorrow’s leaders. I am a resident of Masoli, in Kasangati, Wakiso district. While attending a church conference in neighboring Nansana, I was approached by my daughter, who runs the church and told me of a mother who was abandoned in the house with six children. I requested to be given 2 of the children. They were very malnourished, with skin diseases and many signs of poor feeding. When we reached home, the first thing I did was to give them deworming tablets, preparing herbal medicine to cleanse their bodies and shaving their untidy hair. Within 2 weeks the neighbors were already appreciating my efforts. This work gave me a lot of satisfaction and happiness. My act was a signature of love. When members of the church saw the improved children, they really appreciated my work. Then one church member, a young girl, told me of how his brother of about 14 years was being mistreated by their step mother and requested me to look after him. Because of my soft spot for children, I agreed and brought him as well. He had even developed bad manners. I told him bad manners are not tolerated under my roof. With time he has improved and is a now a good behaving boy. After about a month, a tenant moved in a house near my residence. The landlord had given them the room temporarily after failing to pay rent for their former rented room. The husband disappeared a few days later. The abandoned woman would only cook porridge for the children, of which they took one meal a day. The last born of these are twins. One day, one of the children stole a cake from the nearby shop. The mother was so angry and decided to take the child to the village to stay with her relatives. I realized this was not the solution because even in the village, this 11 years old child might even develop more bad habits. I first prayed to the Holy Spirit for help and then requested the mother to give me the boy. Within a week, she brought me the second child. This one was 4 years old. She could not manage to ease herself or even attempt to speak. She could not just take herself to the toilet. I had to teach her. Now she even helps in cooking, washing utensils, and is very lively. When I went back to the church, one of the members of the congregation had been evicted from her room for failing to pay rent. She was sleeping on the church’s verandah with her three children. It was very stressful. Then the pastor decided to take one of the children as I took the other two. One of them, a boy, is 11 years old but has just joined middle class.I wonder why people are more interested in giving birth before assessing whether they can manage looking after the children. The mother of twins would bring them at my home whenever we had overnight fellowships. But you could only see the heads. At two and half years, these twins were stunted. They were always crying and any pleas of having her to take them to the hospital were ignored. 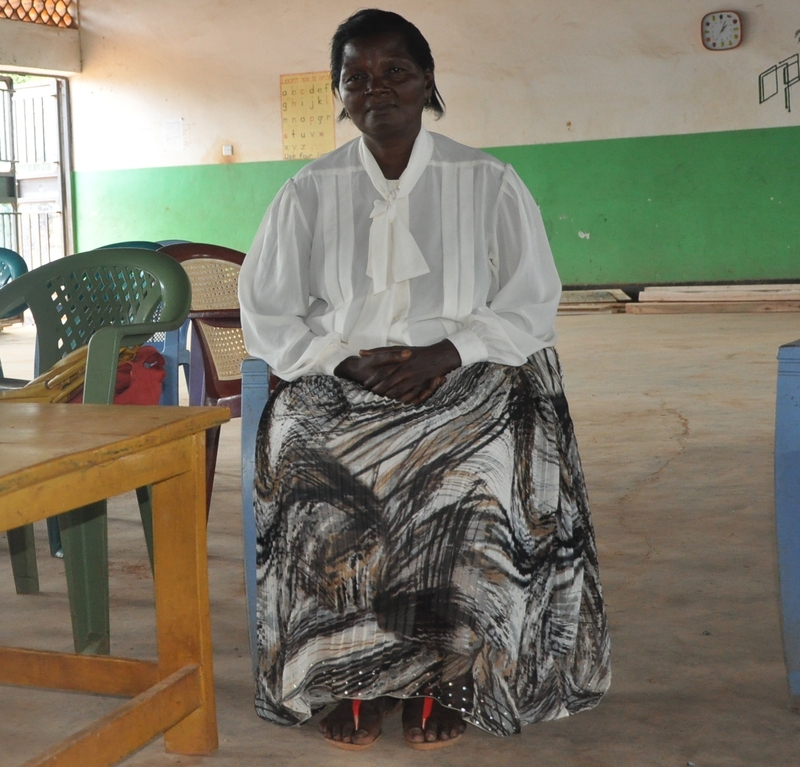 One day, we decided to take her to Kasangati police station for help because community members got very concerned. Even though my own son was involved in an accident and bed ridden, I first joined community members at the police station before going to attend to my son. At the police station, the mother of twins was forwarded to Mulago Hospital for medical attention. Theyare now admitted at the hospital in the Mwana Mugimu Nutrition Unit; a ward that medically handles nutrition complications in children. At least now we know they are in safe hands. Mulago Hospital is the national referral hospital. I feel bad when I see people suffering and have always prayed to God to make me rich so that I could help more people; start an orphanage for abandoned children so that I personally take care of them and not in hospitals or with maids. I have five children of my own. The two eldest girls are married. The last born is in senior six. My husband passed away four years ago. One of my in-laws temporarily gave us the house we are staying in at the moment so that I raise the children. Alongside the house are 4 acres of land. We dig and cultivate our food. I also rear broilers (chicken) in the compound, have 2 goats and sell home baked snacks to raise some money. My love for children is big, I would love to cater for more children but my resources are limited. We share two rooms and a garage; the girls and I share one room, the boys sleep in the garage plus one multipurpose room.My children would ask me; “mum we hardly have what to eat, why are you bringing other children to be with us?” Over time, they are used and even support me in looking after these children. I believe that if I make a child happy, God is happy with me and this gives me the morale to get up and cater for these children. I am so happy that CALM Africa does recognise my efforts and is now training me to be a good foster parent and understand good parenting. I am ready to support children live a better life and reach their full potential. Training more foster carers enables children to remain with siblings and within a home environment, rather than going to orphanages. Having more foster carers will reduce demand on those, like Nassali Noelene, taking care of so many children which this on-going programme is working towards.